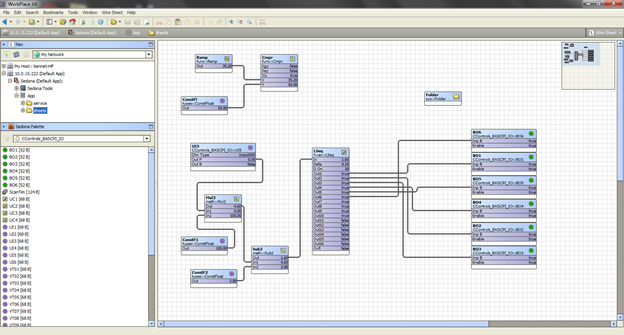 Niagara Workbench is a powerful application for configuring and programming BAS devices such as the JACE. It is also now possible to use Workbench 3.8 (version 3.8.111 or earlier) to program a Raspberry Pi to perform control. In 2006, Tridium developed a control technology called Sedona Framework, which is a software environment designed to make it easy to build smart, networked, embedded devices which are well suited for implementing control applications. Sedona has been added to many building automation controllers. Tridium added support to program these Sedona devices using Workbench, but unfortunately they dropped this support in the Niagara 4.x versions of Workbench. The support still exists in 3.8.x Workbench. By adding Sedona to the Raspberry Pi, it is possible to use Workbench 3.8 or earlier to program a Sedona application that runs on the Raspberry Pi. As the Raspberry Pi's built-in I/O is fairly limited, we developed a low cost I/O board, the BASpi, which attaches to a Raspberry Pi and provides 6 universal inputs (thermistor, 0-10V, contact closure and pulse) and 6 relay outputs. It also provides screw terminal connections for these points. We also ported Sedona to the Raspberry Pi so the I/O can be easily programmed by Sedona compliant editors, such as Workbench 3.8.x. To program the Raspberry Pi with Workbench, install the BASpi I/O board on your Raspberry Pi and download the Raspberry Pi image from our website. Program your Raspberry Pi SD card with this image or purchase the entire BASpi-SYS product which has everything pre-loaded. Then download the Sedona Framework TXS bundle for Workbench at www.ccontrols.com/basautomation/workbench.htm and the Workbench Component Bundle from the same webpage. After you have installed the TXS bundle and the Component Bundle you can connect to your Raspberry Pi in Workbench by going to File->Open->Open Device menu. Below you can see Workbench being used to program a Raspberry Pi which has the BASpi board. To add components to the BASpi wiresheet you need to open the Sedona Palette sidebar (Window->Sedona Palette). Once opened you will see all of the components you can use to program the BASpi Sedona application. The components are stored in folders also known as "kits". 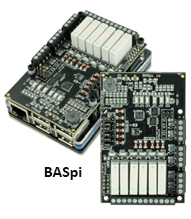 The BASCPI_IO kit has the components that allow your application to read from the BASpi's six universal inputs and write the BASPI's six relay outputs. The BASpi also supports BACnet/IP so your Raspberry Pi, when used with the BASpi and its Raspberry Pi firmware image, can provide the ability to read the BASpi points and write the BASpi outputs. It can also be used to read/write the twenty-four virtual points which are accessible via BACnet/IP. These can be setpoints, alarms, etc.